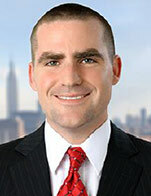 David Perlman is a member of the cross assets strategy team posted in New York, covering Exchange-Traded Funds. He previously spent over eight years with Morgan Stanley. He started on the wealth management fixed income desk before joining the Exchange-Traded Fund and Closed-End Fund Research Team in 2007. In collaboration with other analysts, he published reports discussing ETFs and CEFs and worked with financial advisors and clients of the firm on implementing investment themes and recommendations using ETFs and CEFs.